January 22, 2019 – All coaches, players, parents and football fans are invited to enjoy a celebration of high school football and the 2018 Real Men Wear Pink (RMWP) campaign. The ESPNDecatur Real Men Wear Pink High School Football Awards is a yearly awards ceremony held at different schools in the coverage area of Neuhoff Media. This year, the event’s host school is Maroa-Forsyth High School and will be held Sunday, January 27 at 6 p.m.
Watch as the area’s finest football talents are honored as well as each RMWP school recognized for their contributions to this year’s campaign. 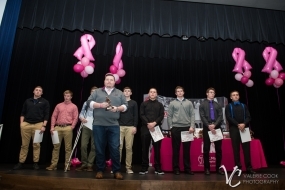 Awards at this year’s event include: top quarterback, running back, pass catcher, offensive line, defensive lineman, linebacker, defensive back, head coach and pink warrior. The Pink Warrior Award is given to someone who has made a special impact in the fight against breast cancer. This could be a survivor who is especially strong and has an inspiring story or someone from the community who went above and beyond in raising awareness for the disease.